1 :: Are you in Dallas tonight? 2 :: Need something artistic and charitable to do? 3 :: Would you like to hang out with some relatively cool people and look at pretty pictures/artwork while listening to awesome jazz music and sipping on a complimentary cocktail? 4 :: If you answered 'yes' to any of the above.... then join us TONIGHT from 8pm-12am for HYPE02! HYPE is a holiday party thrown by a family of artists with the simple purpose of bringing friends together to experience, interact with, and purchase new art, while listening to good music, and enjoying community. Throughout the course of the evening, artwork from carefully selected artists would be up for auction — the majority of those profits will return to the the artist and the remainder will benefit Fuel.ph, a charity in the Philippines. 100% of profits from the door & bar will be donated to Fuel.ph. 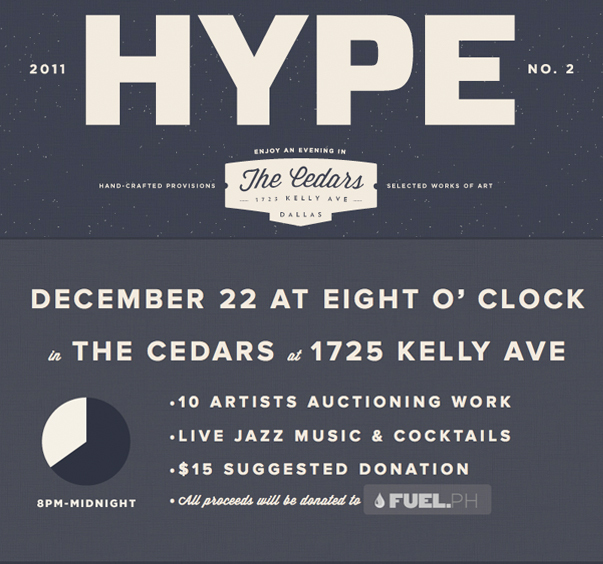 The showing and auction will be hosted in the old Dallas Power and Light building of the Cedars neighborhood from 8pm-12am December 22nd, 2011 [also known as, TONIGHT!] in Dallas, Texas. With beginnings in Deep Ellum in 2008, HYPE/01 was a success, with an attendance of over 600. Every artist sold work in the auction, and over $5,000 was raised for Sowers of Seeds, a water-based charity in India. This year is only going to be better!